armpower.net: Dmitry, in November 2018 you are facing very difficult fight at Vendetta All Stars - Armfight # 50. Seems like nobody of the world’s top pullers would like to be in your shoes. You will arm wrestle with the rising star, the huge and undefeated Levan Saginashvili. About what you think about your opponent we'll talk later. 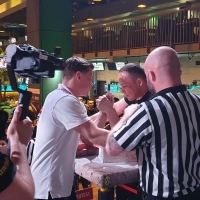 Now please tell us about your preparation for the fight, about possible changes in the training process, and generally about the 6-round format of the armwrestling duel called "Armfight". Why armfights are so popular today? Dmitry Trubin: The 6-round format is a very good move for promoting our sport, as there is much more entertainment in it than in the tournament grid. This is 100%. Will I change anything in preparation? Well, in principle, the preparation will be based on the same training methodology, but adjustments will be made ... have already been made in nutrition, and adjustments in training program have already been made as well. I have started working in new mode ... but I will start more intensive preparation three month before Vendetta. That’s it. Now I add more sparring, working at the table. I have reduced weight lifting a little bit. Let us thank Dima for the fact that he, albeit a little, but opened the veil of secrecy over training before Vendetta. It will be useful for the will be useful young pullers, beginners to learn more about the intricacies of preparation process for an unprecedentedly difficult heavyweights’ fight. We wish him success and will follow the course of his preparations. Experts about the women's armwrestling and not only.